starting point for sailing holidays in the north Aegean since it is the only proper yacht charter base in the vicinity. With its equable climate and beautiful sandy bays it is a popular holiday destination, particularly favoured by Greeks. Skiathos' main source of income apart from the tourist trade is its 600,000 olive trees. The ruins of the islands' medieval capital, Kastro, are located along the west coast on an impregnable crag. The remaining stretches of town walls and the drawbridge can be visited by boat or over land by beautiful winding dirt roads. The lush and fertile inlands as well the monasteries are indeed the most appealing part of Skiathos. 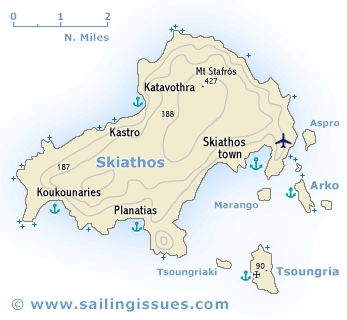 Skiathos was never a place of any importance in ancient times. Herodotus mentions the island in connection with the naval battle off cape Artemision (480 BCE), reporting that the men of Skiathos conveyed information about Persian naval movements by means of fire signals.